Make a New Year’s Resolution that really counts! Inversion season is upon us, and now is the time to act. This year, make a New Year’s Resolution that really counts — make a Resolution to Clear the Air. Utahns from all walks of life are making small changes in their travel habits this winter to reduce their impact. Resolutions are large or small, and include taking TRAX to work three times a week, carpooling to weekend events, and being idle free. Every small step helps move us forward. So make your resolution and share it with us! Our first video New Year’s Resolution to Clear the Air comes from Monica Fischli, who resolves to walk to work at least three times a week during the winter months. While we all are not able to walk to our destination, let her resolution inspire you to make your own small changes to drive less and help clear the air. It is important to understand how air pollution is impacting your health, so you can take steps to address your symptoms & limit your exposure. Recently, the Utah Department of Health shared some good advice for staying healthy when Utah’s air is bad. Are you ready to bike this winter? Biking throughout the colder months is a great way to stay in shape and enjoy the outdoors. But it also is important to protect your health. Here’s some great advice from local bike blog SaltCycle. Have you checked out our Learn to Ride UTA video series? From paying your fare, loading your bike on the bus, tackling FrontRunner, to setting up a vanpool, see how easy it is to reduce your emissions with UTA! We’ve been passing out “I Care to Clear the Air” pins to residents making smart, air-friendly commutes. Do you want to show your support for our air? Contact cleartheairutah@gmail.com to secure your own supply to distribute to friends, family and co-workers. They are a guaranteed conversation starter! VIDEO: How to ride FrontRunner. What does your commute cost? Divide it by 10. Call 1-800-RIDE-UTA for personalized trip planning assistance. TIPS: Keep biking in SLC this winter. Text ‘cleartheair’ to 69302 for air text alerts! Do you have a tip? Email us! Congratulations to Kelly Beumber, the winner of the $50 Guthrie Bicycle prize giveaway! Kelly registered for this winter’s Care to Clear the Air campaign via the Clear the Air Facebook page before Thursday, November 17th to be eligible. Kelly, like all registered participants, will receive air quality text alerts when YELLOW/RED air quality days are forecast along the Wasatch Front this winter, access to helpful YouTube videos and an invitation to our special ice skating/pizza party event, to be held at the brand new Gallivan ice rink in February 2012. 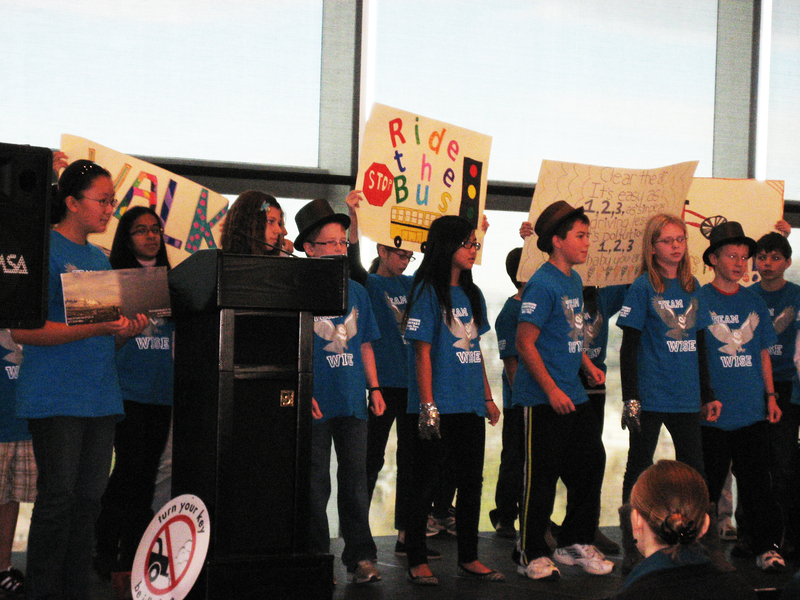 At Monday’s Care to Clear the Air kick-off event, students from Patti White’s 6th grade class at Morningside Elementary shared two original songs they wrote about clearing the air and driving less. Because the songs are so creative, we wanted to share them with you! Sung to the tune of Dynamite by Taio Cruz. I cannot breathe, breathe, breathe, breathe. So turn your key, be idle free, free, free, free. Take as few trips as you can, can, can, can. To make this place a better land, land, land, land, Yeah, Yeah. And we can clean it up right now, yeah. So work together, make it better. We can carpool, walk, ride our bikes tonight. See all the smog in the valley, ee, ee, ee, ee. We may lose funding for our roads, roads, roads, roads. If we don’t make this better soon, soon, soon, soon, yeah, yeah. We can be the cleanest city ever. And we won’t lose our valuable funding. ‘Cause we can’t live, in this smog. We just can’t, so we gotta clean, clean it up right now. So we can carpool, walk around, ride our bikes—-ride bussssssssssssssssssssssss. And the solution we will find. Let me tell you what it’s all about. Your life isn’t gonna be complete. Thank you to the Salt Lake Tribune and reporter Judy Fahys for helping us spread the word about Care to Clear the Air this winter! Patti White’s Morningside Elementary sixth-graders are ready to help kick off this winter’s Care to Clear the Air campaign on Monday. The students in East Millcreek have been tracking their own progress in saving energy, and their Team World Initiative Save Energy — aka Team W.I.S.E. — has put together energy conservation lesson kits. 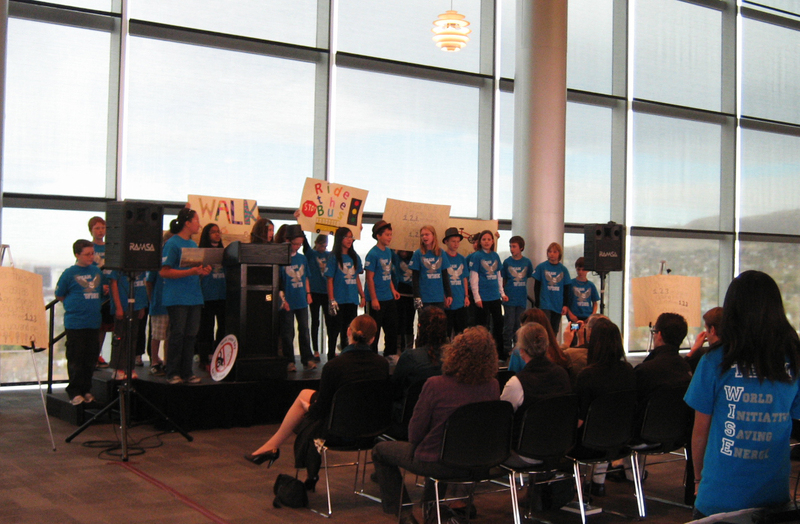 Wearing their clean-air T-shirts, they’ll sing and dance the songs they wrote to remind everyone what can be done to keep northern Utah’s air clean during the inversion-prone summer months. The campaign offers tips on how to reduce winter driving without too much trouble. To participate, people must register, then they can access clean-air aids, such as real-time air quality text alerts and helpful videos. Businesses are also invited to participate. They can encourage their employees to use alternatives to solo driving, including carpooling and teleworking on poor air quality days. To enter, you must be Utah resident. The giveaway is open to drivers, travelers and commuters of all ages. Entry into the drawing and acceptance of a prize constitutes permission for the the Clear the Air program, and/or our promotional agents, to use the winner’s name, photo, likenesses and prize information for advertising and promotional purposes related to this drawing without further permission or compensation. Clear the Air will select one grand prize winner ($50 gift card) and ten runners up (UTA group pass). Winners will be notified by email within one week of the winner announcement date, using the email address provided on the entry form. No financial compensation will be provided to winners.